Using this method, the crew is able to digitize 1 million images per week! FamilySearch is now doing beta-testing on having those images available almost immediately, without indexing. David Rencher had asked us if we preferred to have images with indexes years from now, or have the images posted online to browse right away. Naturally we all favored the immediate access to images online ~ a quicker alternative to ordering microfilm and then cranking through each roll in search of our ancestors. 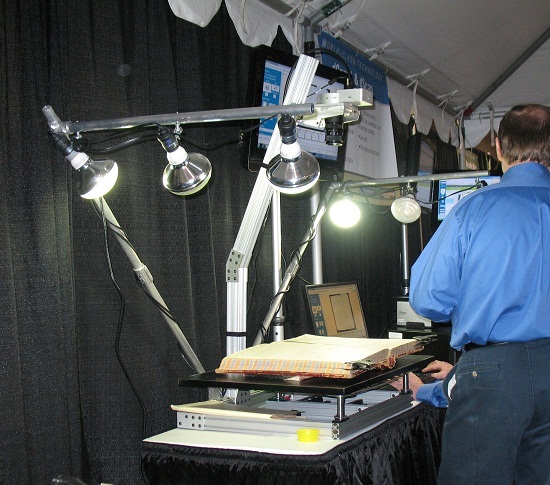 The historic document viewer used at FamilySearch.org makes going through digitized images less effective than microfilm. With fil even though there is a wait to receive, you can scroll at your own speed with no limits. On the Internet we are not only troubled with loading speed, but the viewer on FamilySearch can only load one image at a time and only moves one at a time. A viewer like Footnote.com and Internet Archive would allow jumping any number of pages for quicker browsing. Footnote.com's thumbnails are a helpful viewer tool as well as Internet Archive's page turning option or slide bar. There will be some dependence upon Internet load speed still, but a better viewer would dramatically help. Even options to set the viewer for lower bandwidths loading less crisp images faster would be a nice option.